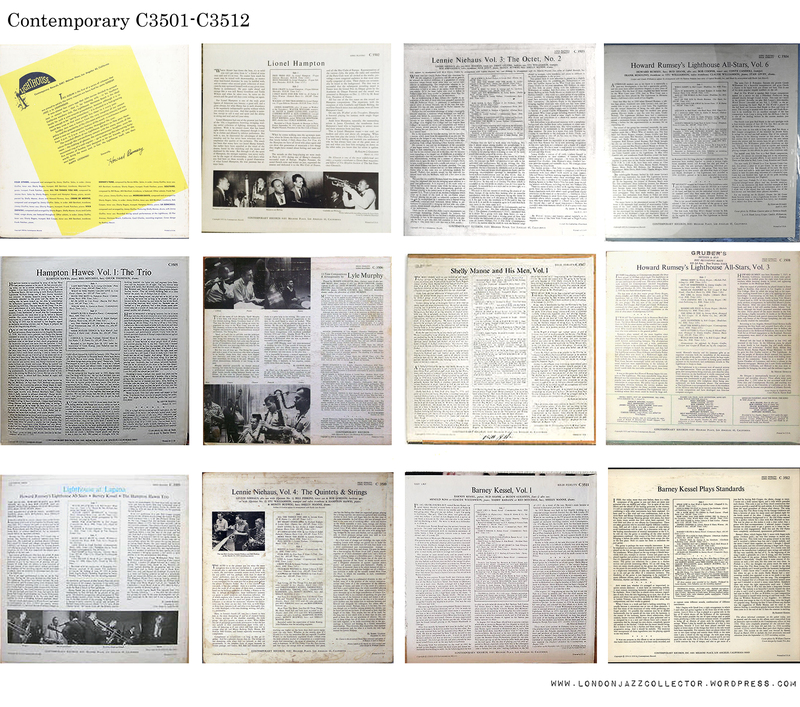 Original Contemporary Records pressings are linked with original covers as well as labels, which helps confirm their original status. Information what constitutes an original is thin on the ground, so sellers often hold back from making any claims. The information and design of the back cover goes a long way towards identifying this. 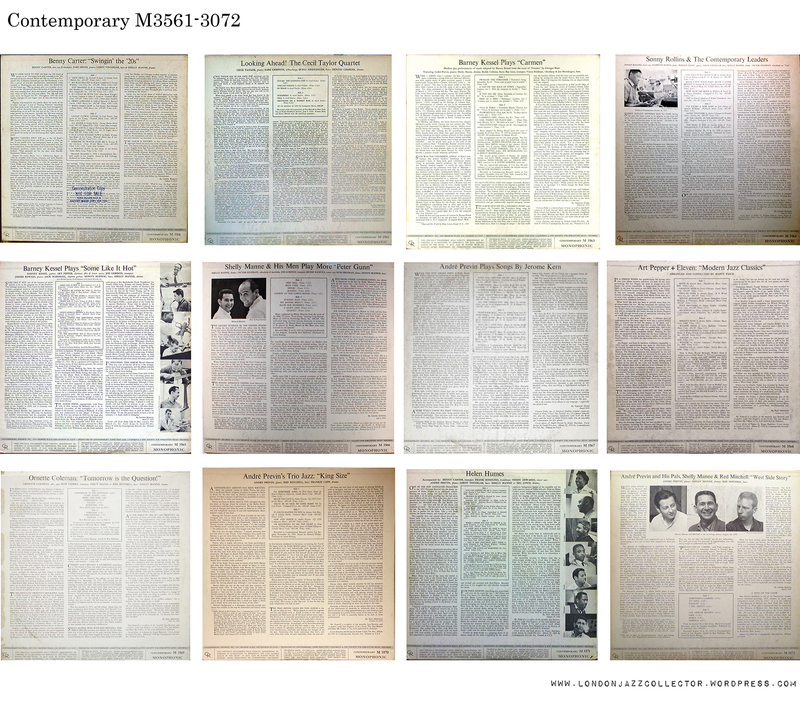 When recordings were reissued over the years they were given the design current for new releases of the day. 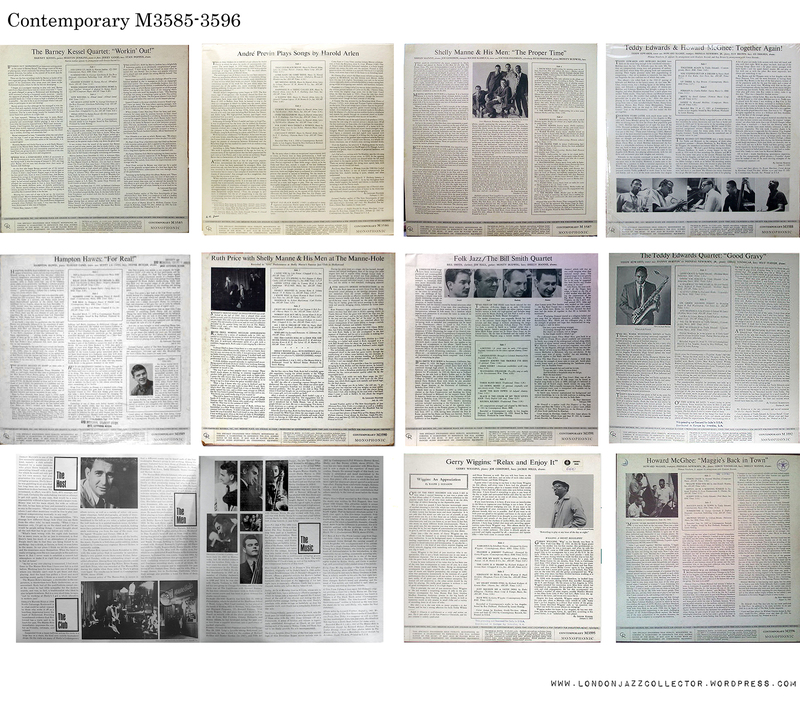 The unique features of covers in the ’50s ’60s and ’70s each have, become clearer as you study the catalogue timeline below. 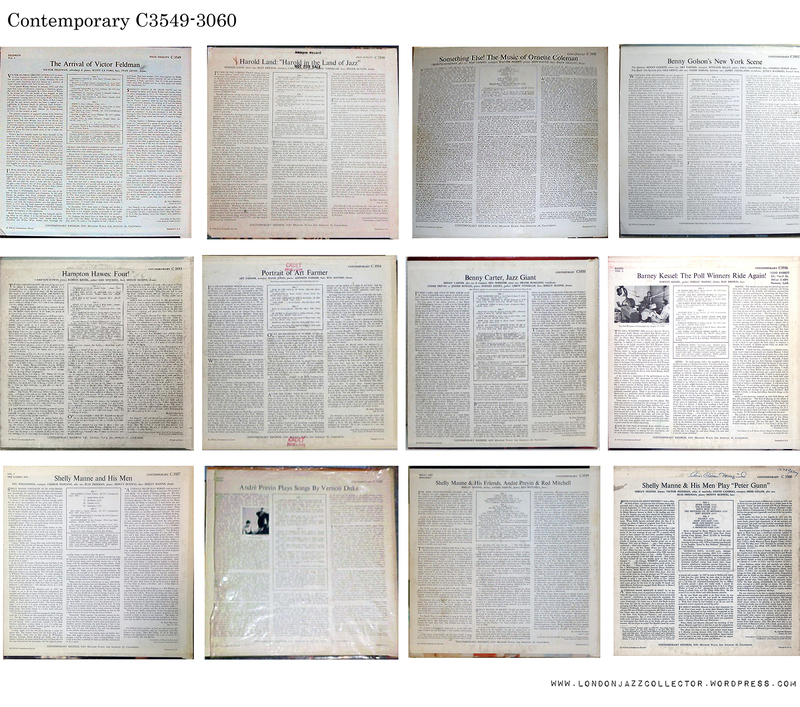 Sourced from the bounty of the Internet, the seller photography leaves a lot to be desired, however the timeline provides a unique historical oversight of the development of the Contemporary label through the turbulence of the Fifties through to the Seventies. The true origin of any individual record can be found in the patterns disclosed by sequential comparison. 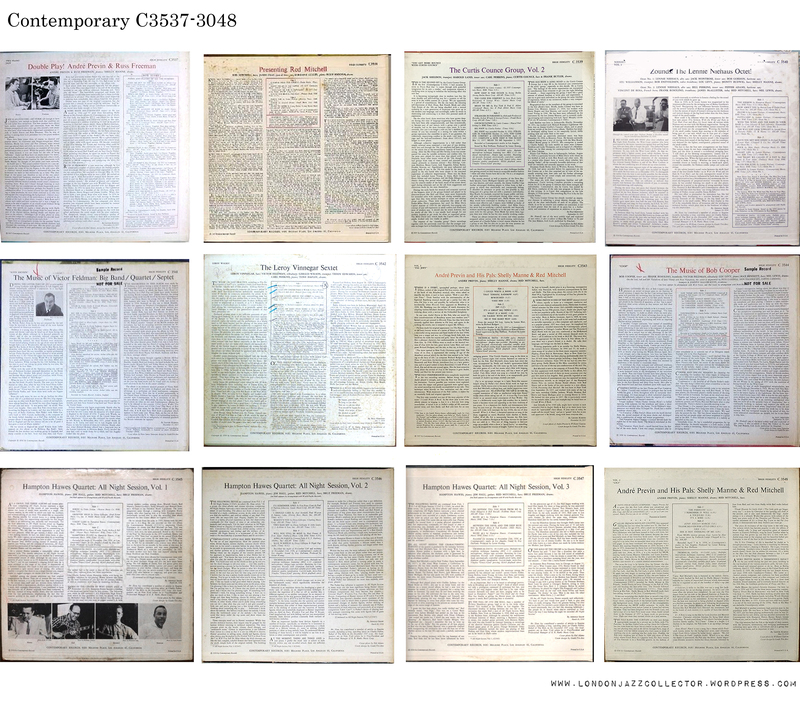 Not every cover has been found, and there are some gaps, where titles are rare without being especially collectible, and have not often found their way to market. But the overall picture is entirely convincing, not withstanding any small discrepancies. C3500 series ends at C3559, and divides between Monophonic M3500 series and Stereophonic S7500 series . These two series introduce the Technical Data Strip across the foot or the top of the liner notes. Covers beyond here are few in number and quite difficult to find – up to M316. It is quite possible these exist in the catalogue but few if any were actually manufactured and sold. Mono had seen its day. The first design includes titles issued between 1959 and 1963. 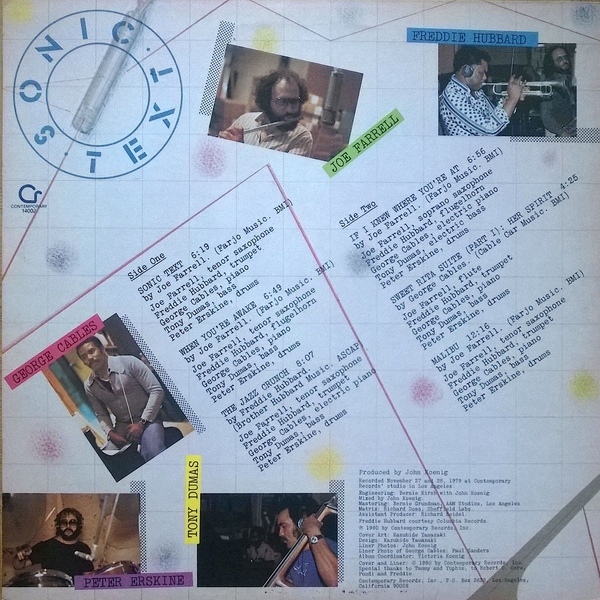 Majoring on technical sound quality, the Technical Data information strip was elevated to a header place on the liner notes. 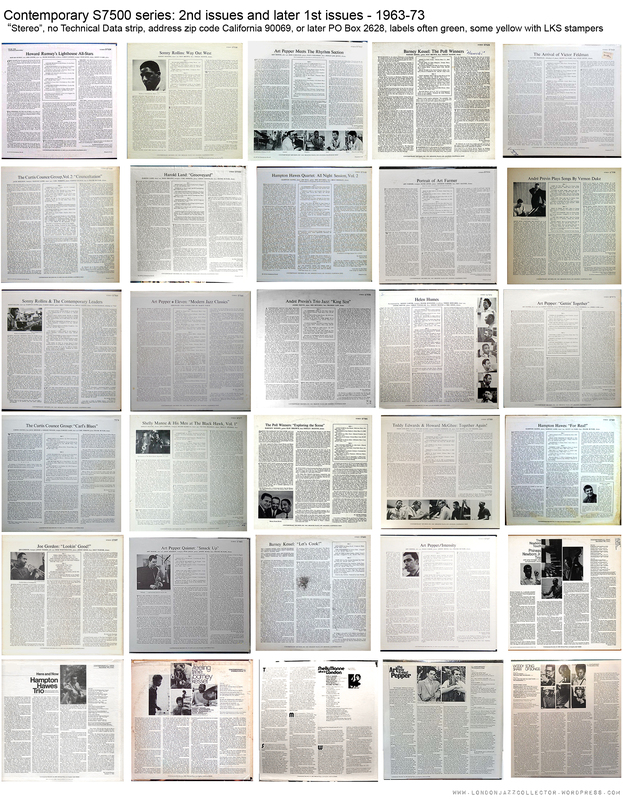 The front cover similarly added a black and white header strip, including a new CR logo. The address on these covers is Los Angeles area code 46, other than at the very tail-end making way for 69 and new zip-codes in 1963. . 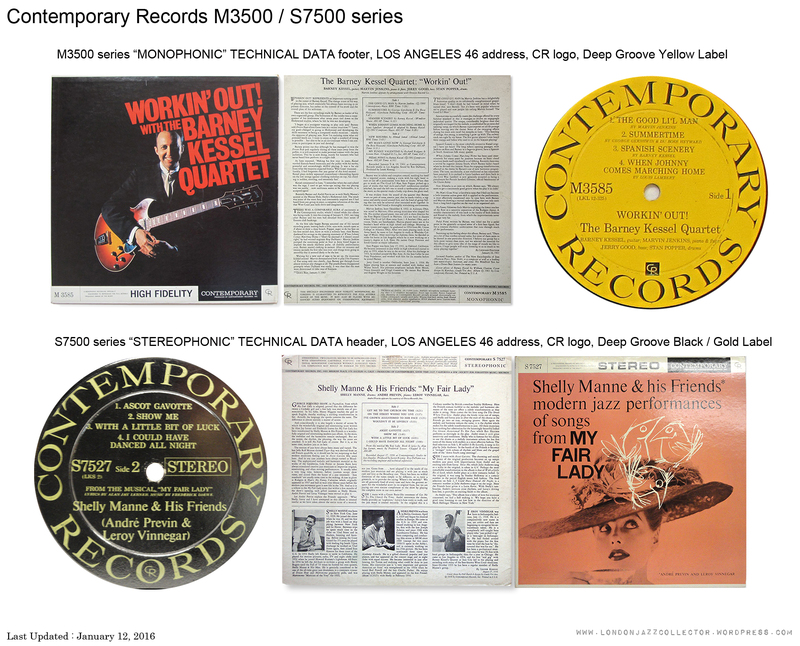 Incomplete series below, some examples not found, but consistently associated with black label gold text deep groove pressings. 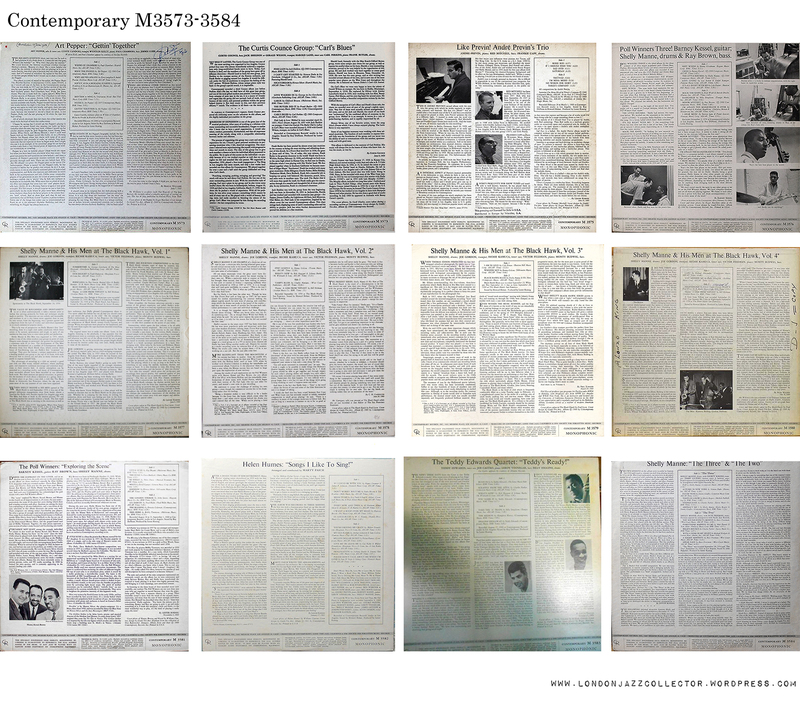 Though it may look superficially the same, the text of the TECHNICAL DATA strip was not fixed over time. 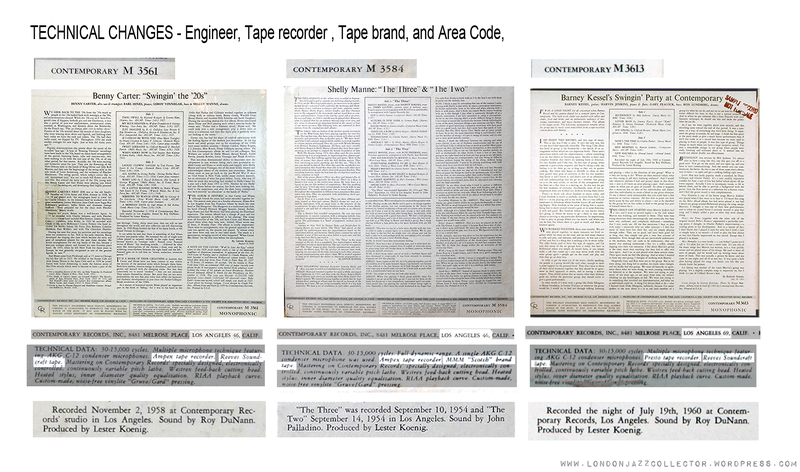 Early copies mention use of an Ampex tape recorder, later replaced by Presto tape recorder, Reeves Soundcraft tape, while MMM Scotch tape appears on very early recordings. At the end of the series, in the early -60s, the area code for 8481 Melrose Place changes from Los Angeles 46 to 69, which was expanded in 1963 to zip code 90069, later still replaced with a Post Box number. 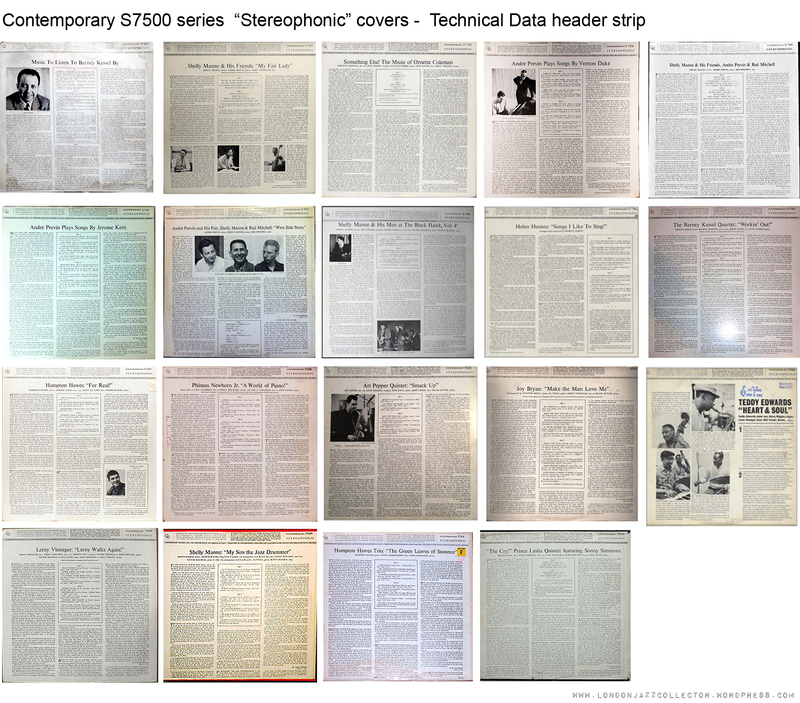 Around 1963 the Technical Data strip was abandoned in both mono and stereo editions, the M mono series discontinued for new titles , and all further additions to the catalogue were in Stereo. 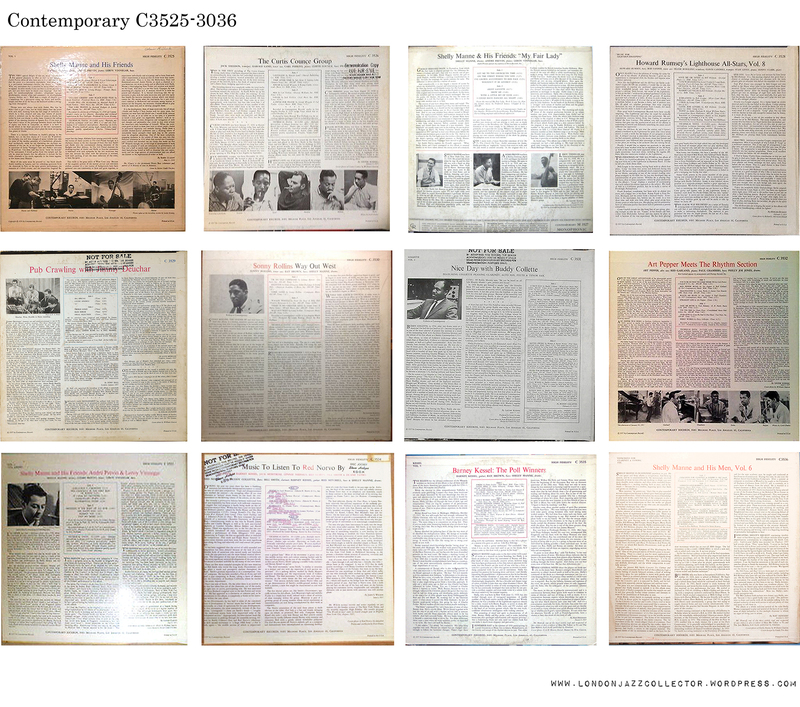 These plain-design jackets (no coloured frames and titles, no headers and footers, no funky fonts) house old favourites given second or third repress, first stereo release of previously mono issues, first release of older recordings previously unissued, or previously issued on other labels (HiFi), new titles from Hampton Hawes, Art Pepper, Barney Kessel and others, and a flirtation with free jazz from Prince Lasha and Sonny Simmons released in the early ’70s. Beyond 1973, through to 1984, there are just a few new titles with increasingly colourful graphic-design covers, diagonal text-flow, funky fonts, in the 14000 series. Its so umm, late ’70s retro, retro that hasn’t yet come back, but there are no bar-codes and the evil silver disc has yet to make an appearance, so it gets my unqualified support. Vinyl forever! 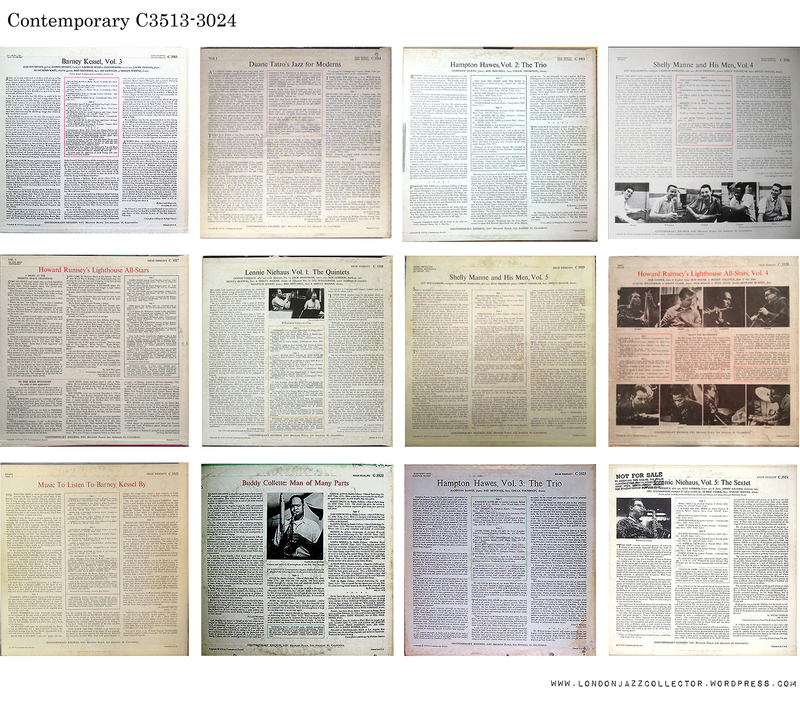 We also see a plethora of ever-reducing vinyl-weight reissues of much of the Contemporary catalogue with stamper codes in higher digits like D7 and even D9. I have to say, they don’t sound at all bad.